I. 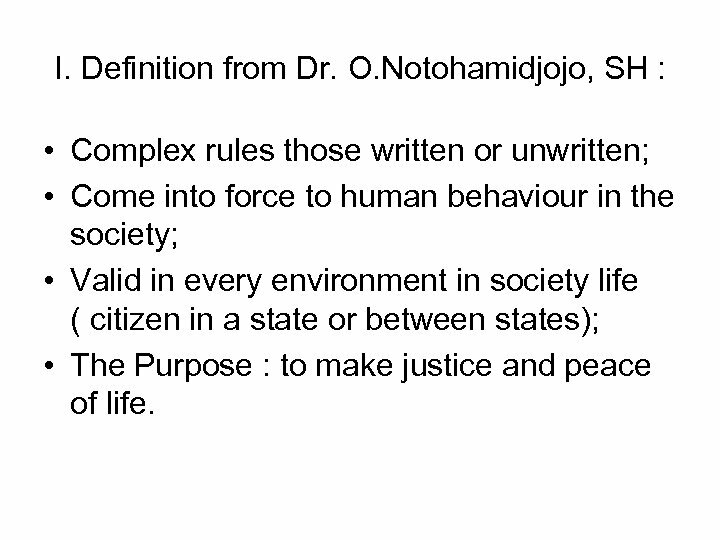 Definition from Dr. O. Notohamidjojo, SH : • Complex rules those written or unwritten; • Come into force to human behaviour in the society; • Valid in every environment in society life ( citizen in a state or between states); • The Purpose : to make justice and peace of life. II. Definition from HMN. 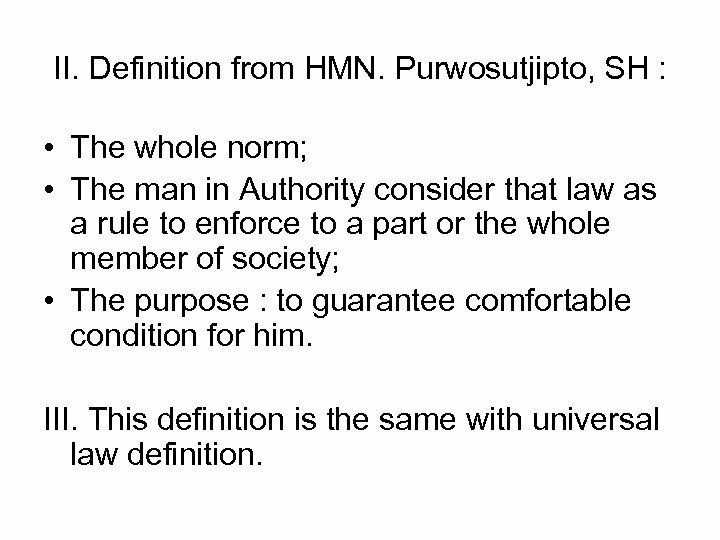 Purwosutjipto, SH : • The whole norm; • The man in Authority consider that law as a rule to enforce to a part or the whole member of society; • The purpose : to guarantee comfortable condition for him. III. 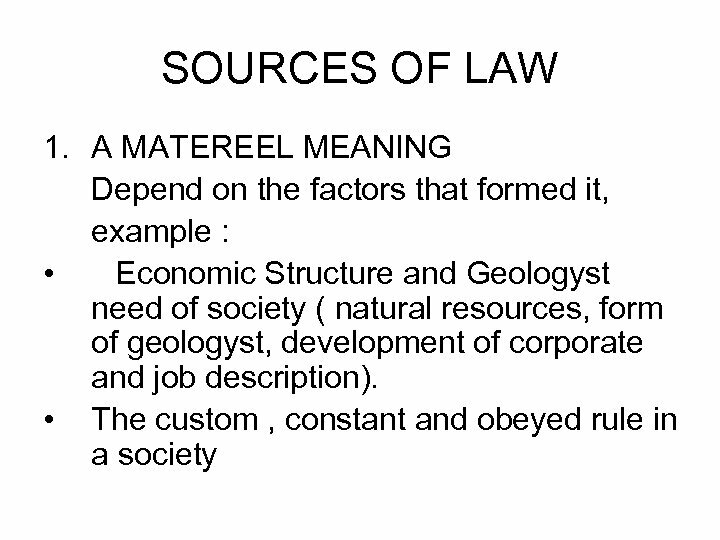 This definition is the same with universal law definition. 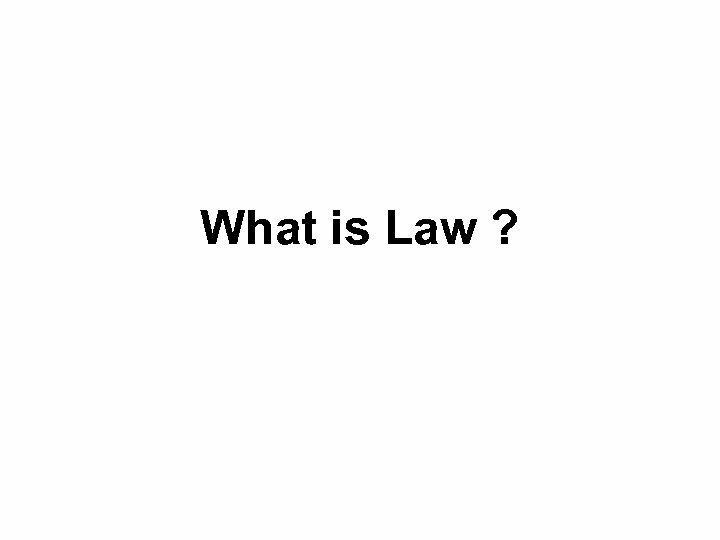 Law definition is not important Why? 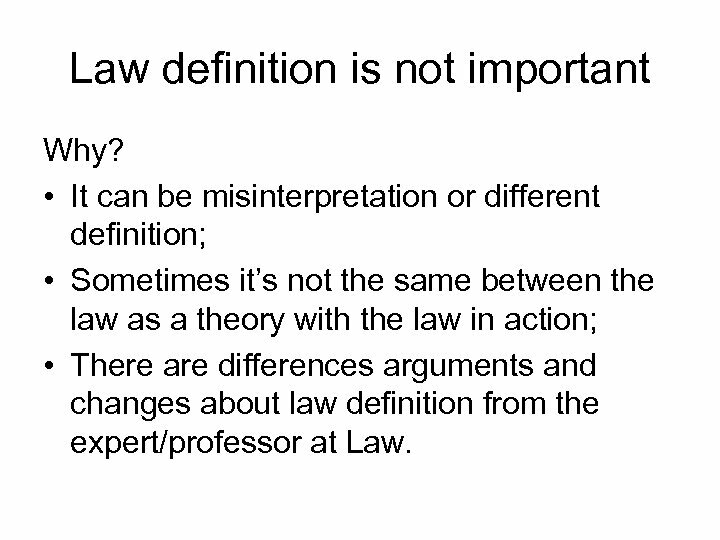 • It can be misinterpretation or different definition; • Sometimes it’s not the same between the law as a theory with the law in action; • There are differences arguments and changes about law definition from the expert/professor at Law. 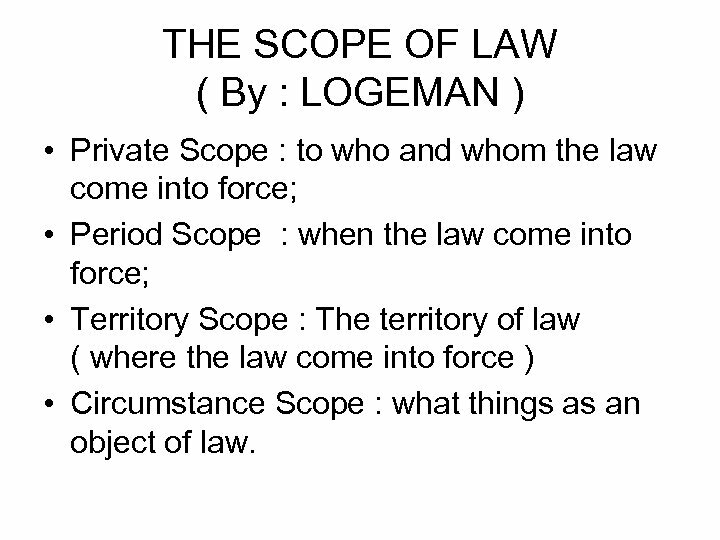 THE SCOPE OF LAW ( By : LOGEMAN ) • Private Scope : to who and whom the law come into force; • Period Scope : when the law come into force; • Territory Scope : The territory of law ( where the law come into force ) • Circumstance Scope : what things as an object of law. 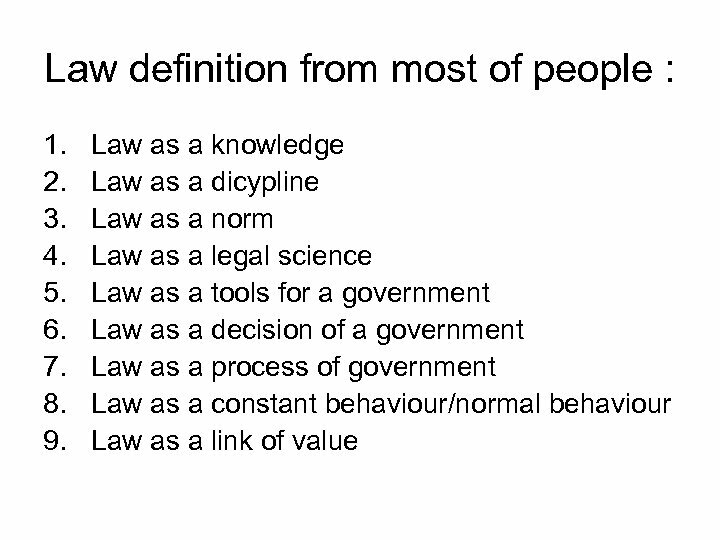 KIND OF LAW PURPOSE 1. 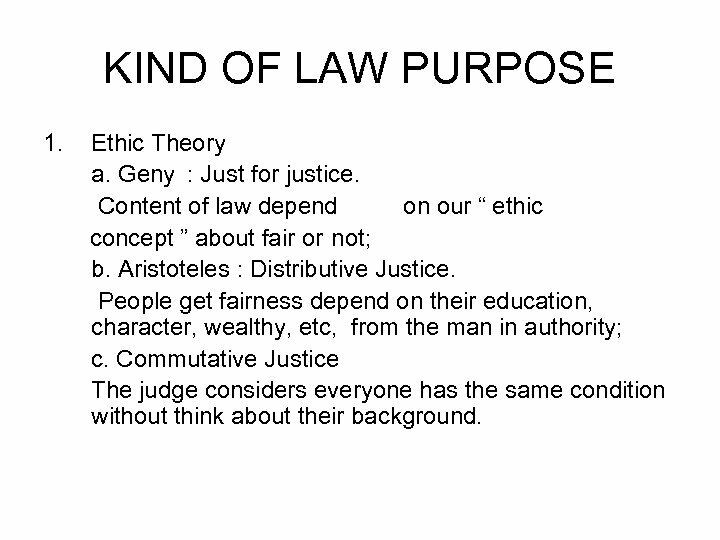 Ethic Theory a. Geny : Just for justice. 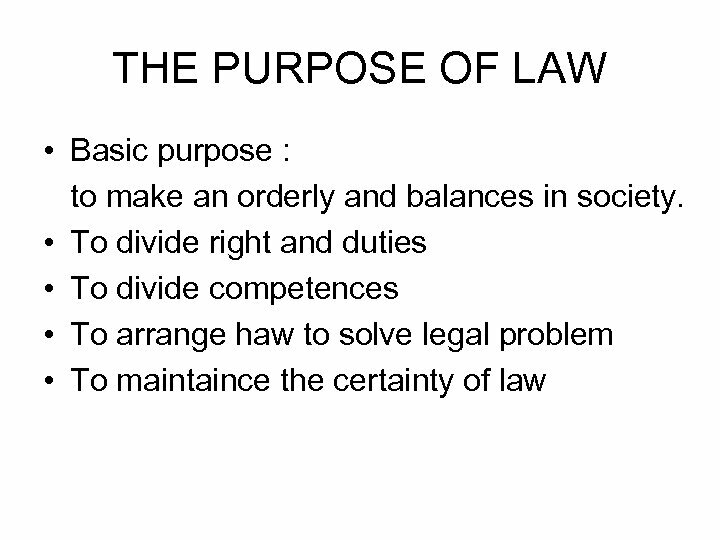 Content of law depend on our “ ethic concept ” about fair or not; b. Aristoteles : Distributive Justice. People get fairness depend on their education, character, wealthy, etc, from the man in authority; c. Commutative Justice The judge considers everyone has the same condition without think about their background. • • A. 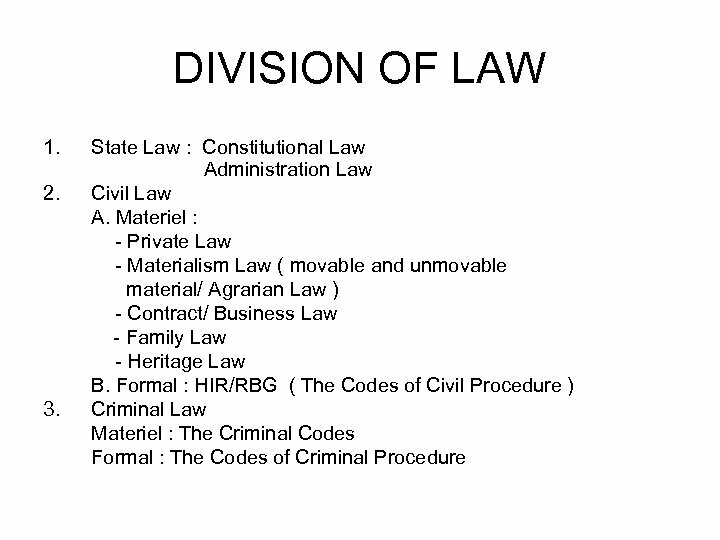 The rule that common and valid in society The rule of foreign law The conviction about religious and morality Law awareness FORMAL MEANING Depend on procedure or formula ( how it is made ) Divide to : a. 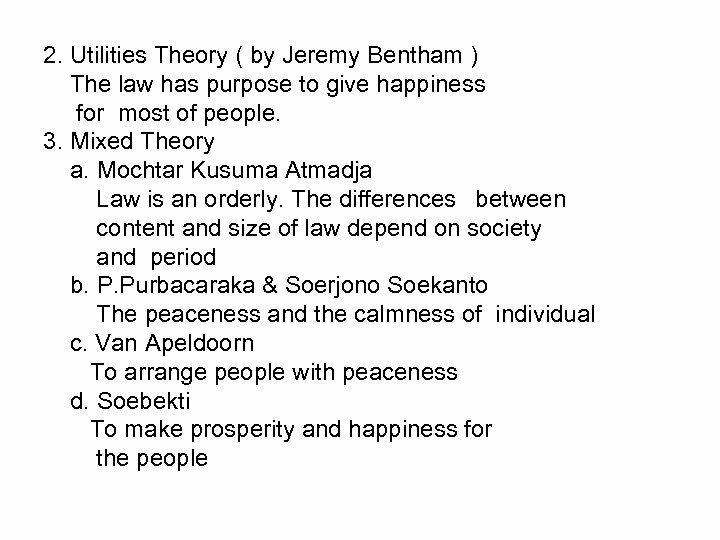 Written formal : Act, Treaty and Jurisprudence b. 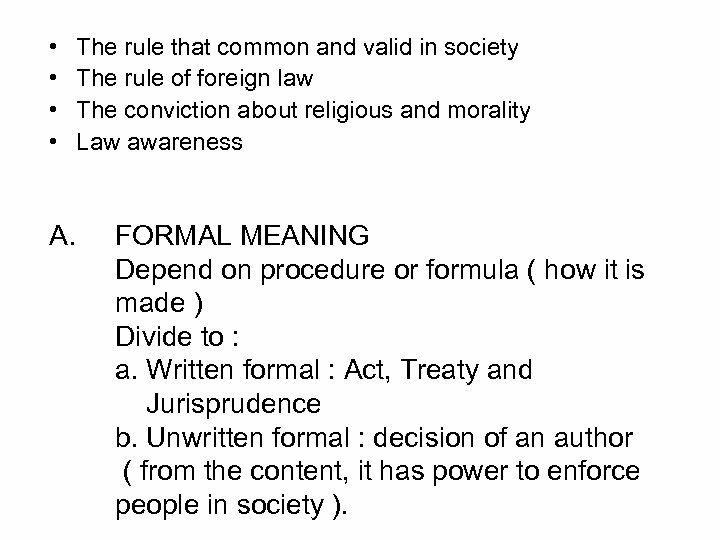 Unwritten formal : decision of an author ( from the content, it has power to enforce people in society ). 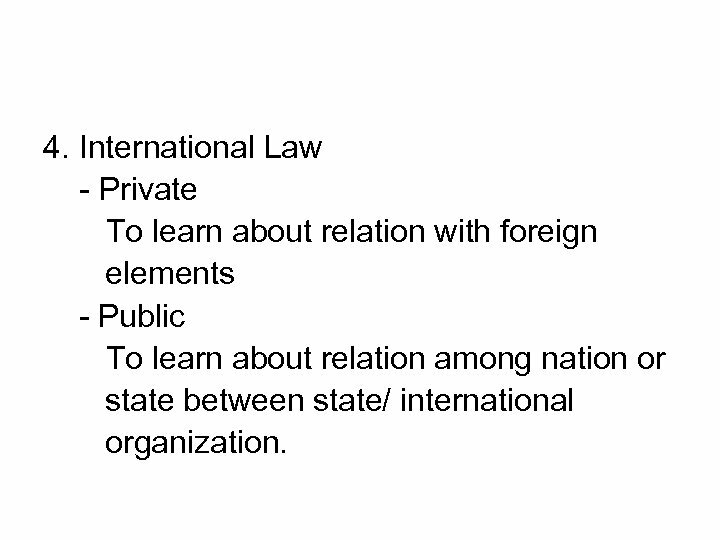 4. International Law - Private To learn about relation with foreign elements - Public To learn about relation among nation or state between state/ international organization. 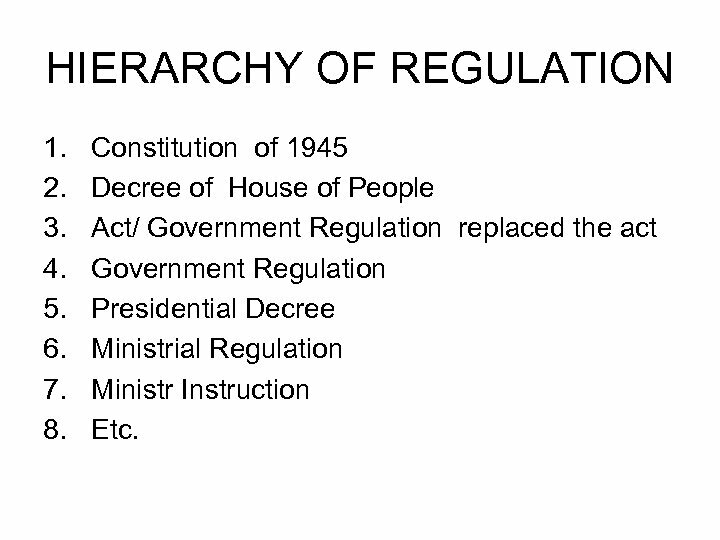 HIERARCHY OF REGULATION 1. 2. 3. 4. 5. 6. 7. 8. Constitution of 1945 Decree of House of People Act/ Government Regulation replaced the act Government Regulation Presidential Decree Ministrial Regulation Ministr Instruction Etc.